DALLAS (AP) — Stars coach Jim Montgomery had the right answer for Florida’s top-10 offense on Tuesday night. 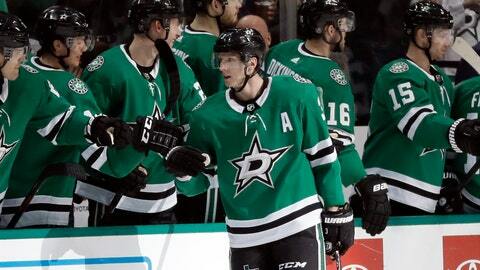 Montgomery countered the Panthers‘ firepower with some of his own, reuniting Dallas’ three top scorers on the same line, and Alexander Radulov got two goals in the third period to send the Stars to a 4-2 victory. “I didn’t like the first 7 minutes,” Montgomery said. “We were sleepy. I just put Jamie (Benn) out there one shift with (Radulov) and (Tyler Seguin). “Initially, we had (Radek) Faksa‘s line going out against (Florida’s top line). Then when I saw our top line get going, I said I was just going to let them go head-to-head. In addition to Radulov’s two goals and an assist, Benn had a goal and two assists and Seguin assisted on all four Dallas goals. Aleksander Barkov deflected Jonathan Huberdeau‘s shot from the right-side boards over the goalie. “I think it went off Faksa’s stick, Barkov, and maybe off Esa (Lindell),” Bishop said. Klingberg had given Dallas a lead for the first time in three games at 10:38 of the second. It was the Stars’ first power-play goal in four games and only the second in the past 19 opportunities. Barkov was more concerned about his line’s defense. NOTES: Barkov has 17 points (four goals, 13 assists) in a seven-game scoring streak. The 23-year-old has career highs of 32 goals, 53 assists and 85 points. … Huberdeau has five points (one goal, four assists) in the past three games. … Stars C Jason Spezza was a healthy scratch for only the second time in his 16-year career. … Seguin’s assists increased his season total to 42. He has reached 40 five times in nine NHL seasons. In the past nine games, he has not scored a goal but has 10 assists.